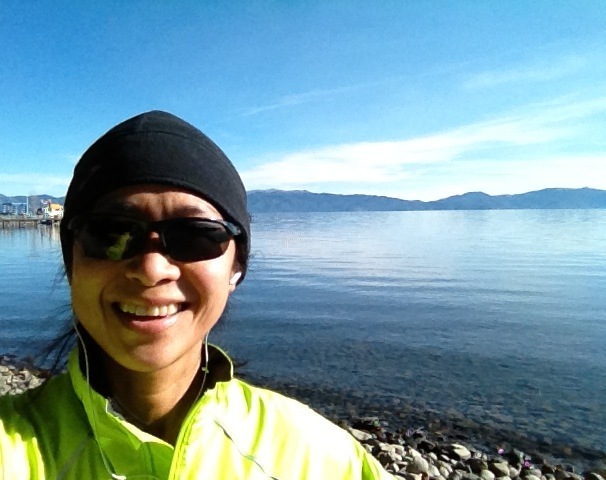 My last run of 2011 was a windsucking 10-miler on the paved trail from the River Ranch to Tahoe City. I was sacked. I can’t use the altitude as an excuse since I’ve been in Truckee 6 days. I have no excuse. I was plain vanilla tired from start to finish. Knowing what Coach Craig used to say about the body having the capacity to press on even though the brain is sending mayday signals to stop, I probably could have pushed further. But my husband and kids were waiting for a ride home after a morning at Alpine Meadows. My time was up. But not all was lost on my final run this year. It was a brilliant winter morning. Sunny, comfortably nippy, barely a wind. The crystal clear Truckee River escorted me until I reached the majestic shore of Lake Tahoe. I spent a few moments standing there pinching myself. If you have never been to Lake Tahoe, you must go. Run, bike, or walk there, if you can. It will take your breath away – this blue rock-lined watery expanse nestled within the jaws of tall mountains. It will remind you of the smallness of humanity compared to monuments of nature that have existed long before us and would subsist better, really, without us. And you will feel glad, at least, that your little body got there on its own terms…breathing steadily…dodging ice patches…moving forward all the way. Tomorrow is another day. Another year, in fact. Many other chances to complete a run the way I intended. This entry was posted in inspiration, marathon, running, training by On these feet. Bookmark the permalink.